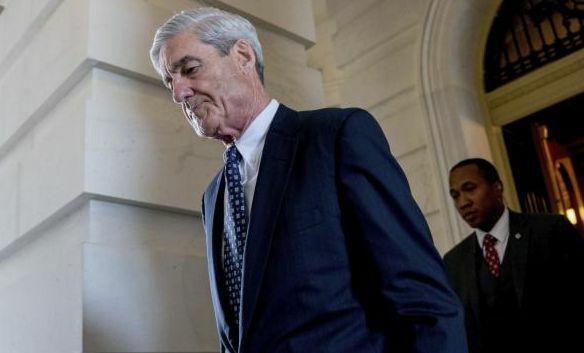 A federal grand jury in Washington has approved the first charges in the Trump-Russia investigation led by Special Counsel Robert Mueller (pictured). The charges are still sealed under orders from a federal judge. Plans were prepared Friday for those charged to be taken into custody as soon as Monday, according to “sources briefed on the matter”. The suspects and charges are still unknown. Under the regulations governing Mueller’s investigation, Deputy Attorney General Rod Rosenstein would have been made aware of any indictments before they were taken before the grand jury. Last month reports said former Trump campaign manager Paul Manafort was close to being indicted over his financial affairs, including connections with Russian officials. Muller’s team has also issued subpoenas for documents and testimony from other Trump figures, including former National Security Advisor Michael Flynn. Donald Trump is being investigated for possible obstruction of justice, including over his firing of FBI Director James Comey in May and his role in a false statement issued by his son Donald Jr. in July about a June 2016 meeting with three Kremlin-linked envoys. There is no indication, however, that Trump is close to facing criminal charges. Interviews and records establish that Russian lawyer Natalia Veselnitskaya liaised with Moscow’s top officials before meeting Donald Trump Jr., Trump son-in-law Jared Kushner, and Trump campaign manager Paul Manafort at Trump Tower in June 2016. Veselnitskaya discussed the provision of material damaging to Democratic nominee Hillary Clinton with Russia’s Prosecutor General, Yuri Chaika. The memorandum she brought to the meeting closely followed a document that Chaika’s office gav in Aprile to Congressman Dana Rohrabacher, a fervent spokesman for Moscow’s line. After the meeting was first revealed in July, Donald Trump Jr. put out a series of false and misleading statements. His denial that the discussion had nothing to do with anti-Clinton material was finally undone by his own e-mails with a broker of the meeting. Veselnitskaya also denied any link with the Kremlin. The memo that Veselnitskaya brought to the Trump Tower meeting alleged that Ziff Brothers Investments, an American firm, had illegally purchased shares in a Russian company and evaded tens of millions of dollars of Russian taxes. The company was the financial vehicle of three billionaire brothers, two of them major donors to Democratic candidates including Clinton. The Ziff brothers also invested in funds managed by William Browder, an American-born, UK-based financier who was the driving force behind a 2012 US law, the Magnitsky Act, imposing sanctions on Russia. Russian officials, including President Vladimir Putin, have recycled the Ziff Brothers allegations this week, as Trump supporters have tried to tarnish Hillary Clinton to divert attention from the Trump-Russia investigation. White House counsel Kellyanne Conway acknowledges that Donald Trump intervened in an FBI process to try and put pressure on Hillary Clinton, saying that Trump personally pressed for an informant’s gag order to be lifted. “He believes, as many others do, frankly, that the FBI informant should be free to say what he knows,” Conway said on Friday. Trump told his staff to work with the Justice Department to allow an undercover FBI informant to speak with Congress about Russian efforts to gain influence in the uranium industry in the US during the Obama Administration. But in a Friday interview, Attorney General Jeff Sessions repeatedly said he had not discussed the matter with Trump, and White House Press Secretary Sarah Sanders said she was not aware of any Trump involvement. Trump supporters are hoping to use an inquiry by the Senate Judiciary Committee to shift focus to Clinton over Russia’s interference in US politics. Lawyers for the conservative publication Washington Free Beacon confirm that it was the original funder for the Trump-Russia dossier from the private intelligence firm Fusion GPS. The attorneys informed the House Intelligence Committee on Friday that the Free Beacon funded the project from autumn 2015 through spring 2016. The project was then picked up by the Democratic National Committee and the Hillary Clinton campaign. The original arrangement between the Free Beacon and Fusion GPS involved opposition research into multiple Republican candidates, not just front-runner Donald Trump. However, onservative billionaire Paul Singer, a major funder of the Free Beacon, strongly opposed Trump in 2015-2016. A statement by editor-in-chief Matthew Continetti and chairman Michael Goldfarb defended the project but emphasized that it initially had nothing to do with Russia and did not involve Christopher Steele, the former British intelligence officer who gathered the Trump-Russia material. Trying to divert attention from the expanding Trump-Russia inquiry, with imminent indictments, Trump supporters such as Fox TV have spent this week pushing the DNC-Clinton involvement, without mentioning the original funder. The Trump Administration denies that political connections had anything to do with a $300 million contract to the small company Whitefish Energy in Whitefish, Montana — hometown of Interior Secretary Ryan Zinke — as doubts escalated about the agreement to restore power in Puerto Rico a month after Hurricane Maria. The company has only two employees and has never had a previous federal contract of more than $1.5 million. Whitefish CEO Andy Techmanski says his company has 300 workers on the ground in Puerto Rico, 75 percent of which is still without power. San Juan Mayor Carmen Yulin Cruz posted extracts from the contract on Twitter to raise a series of questions. For example, the contract claims approval by the Federal Emergency Management Agency but FEMA said it was not involved and any language in the contract claiming its endorsement is “inaccurate”. This was a contract that was determined by the local authorities in Puerto Rico…. [Donald Trump] did ask Secretary Zinke just for clarification purposes and he reiterated once again that we had no role — the federal government — and specifically he had no role in that contract. Cruz also notes Whitefish’s demand for payment within 10 days of work to ask if the firm might have cashflow issues. CBS News reporter David Begnaud adds that the contract stipulates that government agencies have no right to audit or review the “cost and profit elements”, such as $462 dollars per hour for a subcontractor site supervisor. White House Press Secretary Sarah Huckabee Sanders says that every woman who has accused Donald Trump of harassment is lying. At least 16 women have claimed unwanted kissing and groping by Trump. In a 2005 video, released during last year’s campaign, Trump boasted — in sexually explicit language — of how he could grab women and do anything he wanted as a “star”.